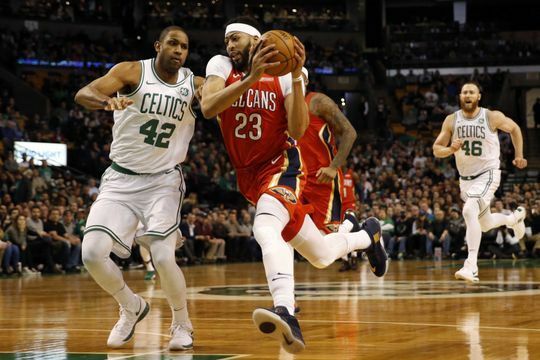 The Boston Celtics lost their first game back from their overseas trip to the New Orleans Pelicans in an overtime thriller, 116-113. Anthony Davis was unstoppable for the 2nd-straight game, powering the Pelicans to a victory behind his 45 points. Kyrie Irving had a rough start to the game that he somewhat salvaged with 24 2nd-half points to lead the Celtics with 27 total, although he shot a meager 33.3% from the floor and compiled 6 turnovers. Jaylen Brown and Marcus Smart scored 16 a piece and Al Horford managed 14 points, 9 rebounds, and 6 assists in 38 minutes. For the Pelicans, Davis was a monster yet again as he followed up a huge game against the Knicks with another. He finished with 45 points and 16 rebounds. DeMarcus Cousins had a double-double with 19 points and 15 rebounds and Jrue Holiday had a solid game with 23 points and 7 assists as he shot 56.3% from the floor, which included some big shots down the stretch and in overtime. The C's started sloppy, looking every bit a team that's played just one game in the last ten days, as they turned the ball over 4 times in the opening two minutes. AD spins out and finishes the Rondo lob! The Pelicans extended their lead to 10 heading into halftime, as they held the Celtics to a porous 36.7% shooting. Marcus Morris led the C's with 10 point and 6 rebounds. #Celtics down 58-48 at the half. Kyrie Irving 3 pts on 0-for-5 shooting for C's. Anthony Davis 25 points, 8 rebounds for NOP. The Pelicans managed to finish the quarter strong though. Davis continued to roll, and both Cousins and Jrue Holiday scored 12 points a piece in the 3rd, putting New Orleans back up 7 after three (87-80). The C's clawed back once again, evening the score at 95-95 just over halfway through the 4th. They took a 5-point lead into the final two minutes of the game, but back-to-back buckets from the Pelicans tied the game at 101 with 1:26 to play. Free throws from Davis had the Pelicans up two with 20.2 on the clock and the Celtics would get an opportunity to match, and Irving did just that as he drove to the bucket scoring a layup with Davis draped over him to tie the game with 11.8 seconds left. Cousins got a deep fadeaway from three as time expired that didn't go...OVERTIME. Extra time started with both teams going shot for shot the first few times up the floor. The Pelicans managed to get the advantage after a pair of Celtics misses and they were able to cling to a 3-point lead for the win.